Oh, how we love Provence. We spent three days there last weekend, and fell in love with it all over again. The region is very fertile, and each period of the year offers different products in season at the colorful markets, and different sights and scents as you drive around the region. In the Fall, the olive trees are brimming with olives and the grapes are just ready to be picked. I bought a bag of the first of this year's fresh olives. They are not stored in a brine, so are fresh and buttery rather than salty. A real treat from the region. We noticed for the first time pomegranates and kiwis on their trees-the region can grow almost anything. 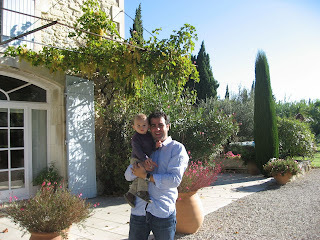 Provence is home to perhaps Gilles' favourite wine area: the reds from the lower Cotes du Rhone (Gigondas, Vacqueyras, etc). We lucked out, and were there during les vendanges, or the grape harvest. 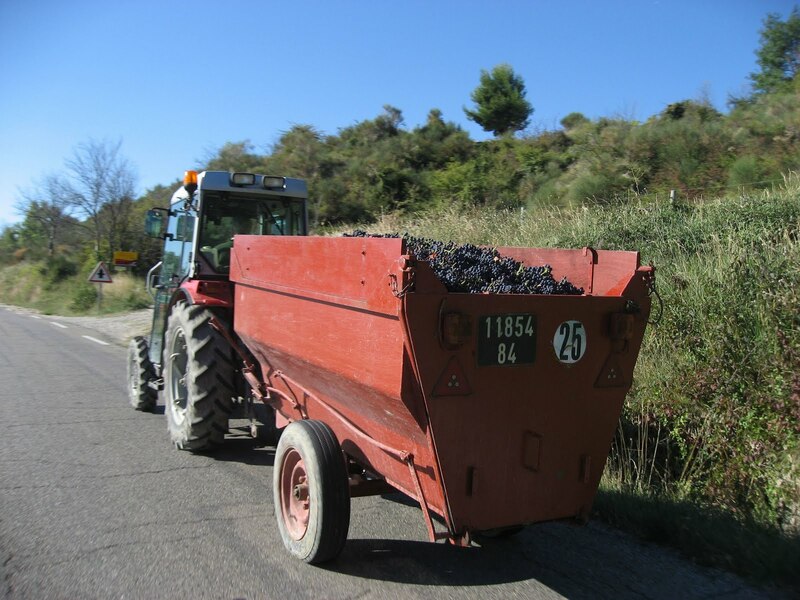 There were people picking grapes in the vineyards, and small tractors pulling trailers overflowing with grapes. The morning we left, we visited the wine cooperative of Rasteau, and at the production facility there was a back-up of tractors overflowing into the road, all full of beautiful, juicy grapes. Our bed and breakfast was nestled between a vineyard and an apricot orchard. 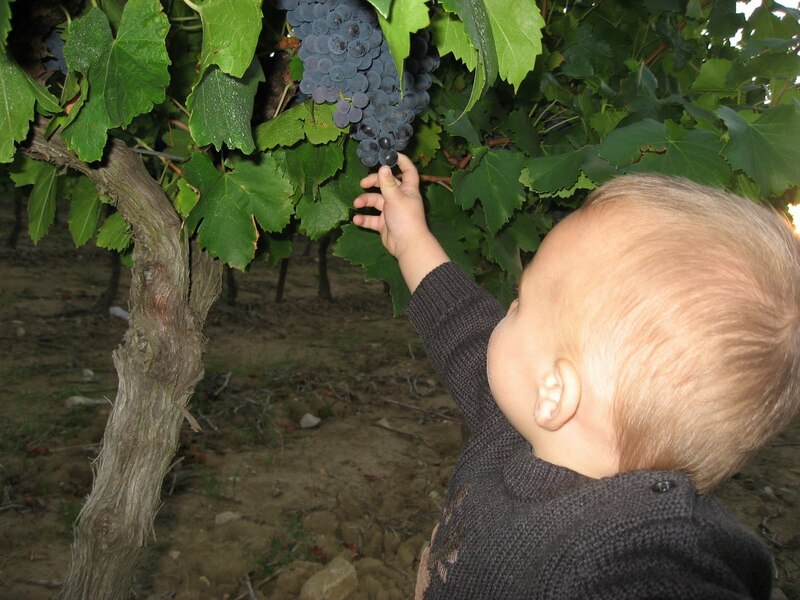 Gilles and Xavier took a stroll through the vineyard, and Xavier sampled grapes right from the vines. They were sweet, with not a hint of sour, likely the grenache grape which is the workhorse for the red wines of the region. Southern France also boasts some of the best Roman sites anywhere. 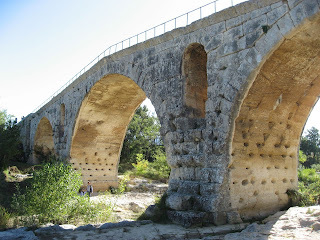 This time we made the trek to a 2,000 year old bridge called Pont Julien. This amazing structure remained a car bridge until 2005! Now Pont Julien is enjoyed by pedestrians and bikers, and Xavier who crawled over and under his first Roman site. Knowing this will be our last visit to Provence for quite some time, we returned home with four cases of wine, three liters of olive oil, and many other regional goodies.